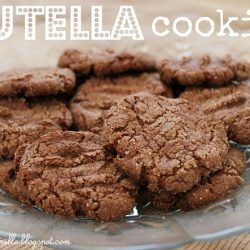 These Nutella Cookies are an easy dessert to make, with only 4 ingredients! They give you your chocolate fix and taste great with a big glass of milk. 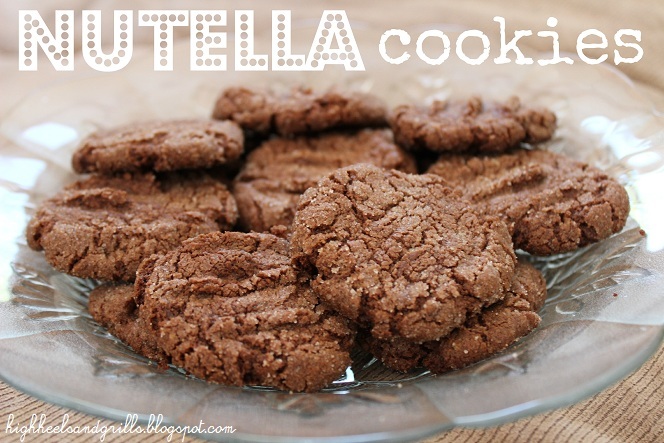 The words nutella and cookies have proven to be very dangerous when put in the same sentence. And the best part is? There are only four ingredients! The original recipe calls for sugar in the actual cookies, but I left out the sugar and rolled the dough in it instead. If you like really rich cookies, go ahead and put it in, but I thought they turned out great without it. Combine the nutella, flour, and egg and mix well. Form into 1" balls. Roll the balls in the sugar and place on a cookie sheet. Press down firmly with a fork or spoon. I loved that these were so easy and still created such a delicious end result. Go ahead and try it and let me know how it goes! Anything with Nutella has to be amazing! I am loving your new blog! Would love for you to visit mine! These look adorable, and totally delicious! And of course I couldn’t be happier to be doing #cookielove this month with another vegan, especially you!